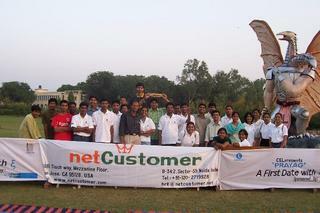 One year ago: Oasis 2004 - The Annual Cultural Fest of BITS Pilani was a couple of days due. I was running around the whole of the institute building, meeting scores of people, thinking of insane stuff in the name of creativity, working on Flash presentations, updating process status docs, getting things in place for an event, and in my free time (which was reduced to a blimp in the space of time) thinking about Z. It was Prayag - a first date with entrepreneurship, an event organized by CEL here. I was the Logistics Co-ordinator and I was a damn busy man. Yes, Prayag was a confluence in its entirety. A confluence of great people, great minds and loads of fun and memories. And true, it has faded away, only to remain as a memory in our hearts. Sometimes, I do wonder, whether I took the right decision in calling off Prayag, but then, it was simply not possible this time to take Prayag to greater heights, and I hate to do an event again - at the same level as the last time.